I wasn't sure where to head next after the previous day's ski on Lassen Peak, I had planned to ski the Hotlum-Wintun route on Shasta, but felt too tired and too unmotivated to undertake another huge day on Shasta just 3 days after skiing Clear Creek and Wintun Glacier. I drove past Shasta in the early evening, thinking and lingering and taking photos, but eventually deciding to bypass it and head north to a motel in Klamath Falls for a much needed rest. I decided to ski the East Bowl on Mount Bailey the next day, a short but nice and steep descent down into a long clearing formed by a huge avalanche in the 1960s. But the next morning, I couldn't wake up until much too late and left the motel around 10am. What to do? Well, I figured that since Bailey is a short trip, I'd get a second chance to ski it in good snow conditions in the evening if I timed it right. So I headed up US 97 and took a right on Silver Lake Road, which leads east across the Klamath Marsh wildlife refuge. This is a spectacular and peaceful spot only a few miles off the highway, with views of the entire southern Oregon Cascades from Thielsen and Bailey through Mount Scott and down to Pelican Butte and McLoughlin, with birds chirping all around. Very quiet and relaxing just parked beside the empty road. Eventually after lunch, I drove back to 97 and on to Diamond Lake and views of Mounts Bailey and Thielsen. Lots of photo taking passed the time until I headed for the Bailey trailhead around 3pm. The road 300 was clear to the trailhead at 5250 ft, but I drove past it to check and found that it was blocked by snow at 5400 ft just a half-mile beyond. So I was hopeful I would quickly reach skiable snow as I started hiking up the dry trail at 3:45. It was not to be, though, as the first 1.5 miles of the trail below 5800 ft were completely bare and continuous skiable snow was not found until the flats at 6000 ft, 2 miles in. I skinned up the steepening trail, often heading to the right of it to avoid numerous bare sections. I managed to skin continuously up the SE Ridge and around the Crater Bowl to the south summit at 8200 ft, but the trail heading north from there along the narrow ridge was either completely bare or buried by very steep exposed snowdrifts. The safest course was to hike the trail until it disappeared into the steep snow and then angle downward and traverse moderately steep scree and soft snow along the upper part of the West Face and finally hike back up to the ridge crest to rejoin the trail just a few hundred feet south of the summit. I reached the 8363 ft summit by 7pm, enjoying the pleasant evening light. A brisk NW breeze and the late hour encouraged a hasty descent, and I skied off the east side only minutes later. Recent snowmobile tracks were nearly everywhere in the East Bowl (as they had been on the upper part of the SE Ridge and in the Crater Bowl), but I managed to find smoother sections of untracked snow. The east side was completely in shadow by now and the upper few hundred feet were smooth and very firm, but below 8000 ft the slope softened into decent corn. I skied a moderate 30-35 pitch angling SE into the bowl, avoiding the steep direct 40+ degree headwall which had lots of machine tracks and recent avalanche debris on it. I followed the old clearing of the avalanche path all the way down to 6200 ft, and then skied south out of the clearing along road 380. A quick traverse brought me back to the trail, and I skied back across the lengthy flats and then down to about 5900 ft. Not a bad evening's work, 2400 vft of pretty good skiing and back to the car by 8:15pm well before sunset. The upper photo shows the East Bowl of Mount Bailey looking up from the edge of the old avalanche path near 6200 ft. Note the hole clearly visible in the rock of the summit ridge. 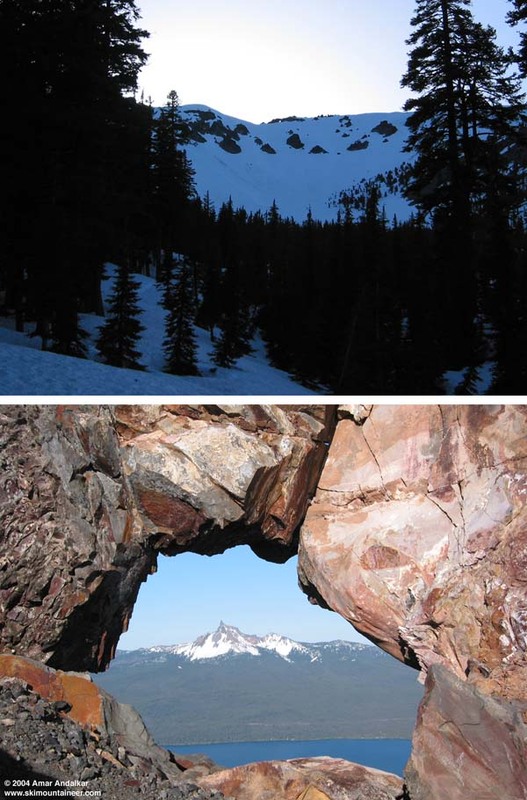 The lower photo shows the view of Mount Thielsen through this rock window during my ascent earlier in the evening. Click here for an enlarged version of this photo. How long was your approach? I skied that bowl with my dad in March; we had to approach from the snopark, and the flats were miserable. It's a nice ski, though.